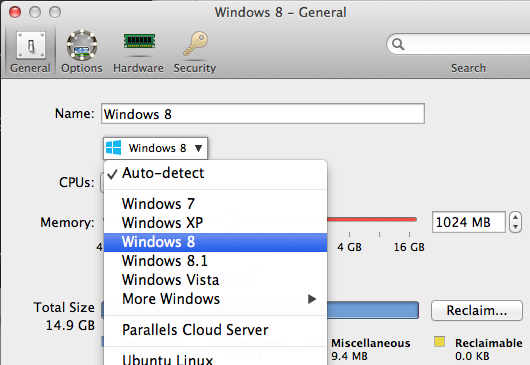 Parallels Desktop for Mac provides a feature called Windows 7 Look for Windows® 8 and 8.1 virtual machines. Note: The Windows 7 Look feature is not available in either the trial version of Parallels Desktop or in Parallels Desktop® for Mac Business Edition. Windows boots directly to the Desktop. 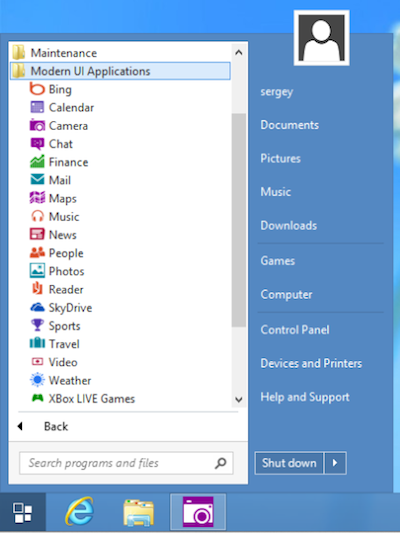 Windows 8 Modern UI apps run inside separate windows. The Windows Start menu is back and fully functional. 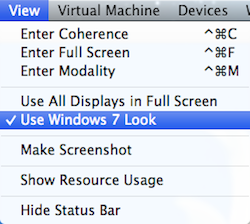 Note: Windows 7 Look is only available for Windows 8 and 8.1 virtual machines. If you upgraded your Windows® XP, Vista, or 7 virtual machine to Windows 8, please make sure your virtual machine type is changed to Windows 8 or Windows 8.1. Go to Configure > General and make sure the type of your virtual machine is set correctly. 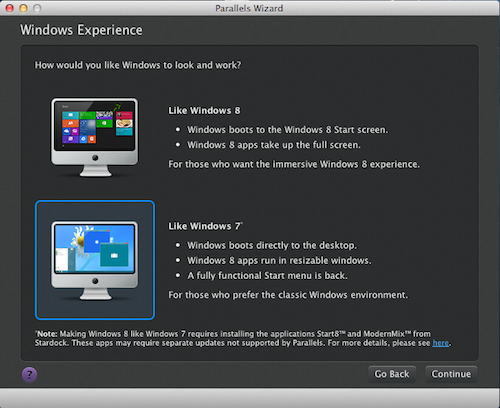 Choose like Windows 7 when you install your Windows 8 or 8.1 virtual machine in Parallels Desktop 9. In the Parallels Desktop menu bar, click on the View menu > select Use Windows 7 Look if you opted not to use "like Windows 7" when installing Windows 8 or 8.1, or if you upgraded to Parallels Desktop 9 or 10 for Mac. In the Parallels Desktop menu bar click on View menu > deselect Use Windows 7 Look. Windows will log out to deactivate the feature. The Windows start menu is back. Your Windows 8 Modern UI apps are available in the Start menu and will run in their separate windows instead of full screen. Parallels Tools should be installed in your Windows 8 or 8.1 virtual machine to make this feature available. 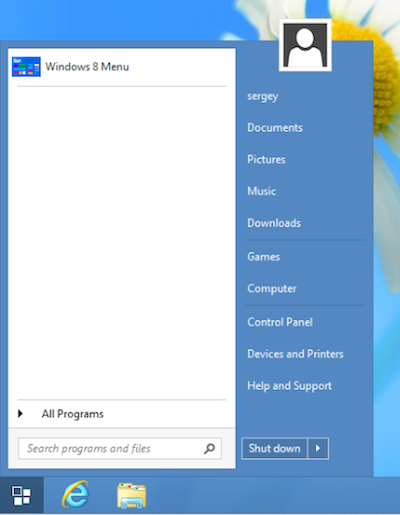 Windows 7 Look is provided by two separate applications, Start8 and ModernMix, which are automatically installed when you activate the Windows 7 Look feature. Your Mac should have an Internet connection in order to download the installation packages when activating the Windows 7 Look feature for the first time. Both the Start8 and ModernMix applications are provided by Stardock. For support questions on StarDock installation, updates, and troubleshooting, please contact StarDock directly at https://www.stardock.com/support/. 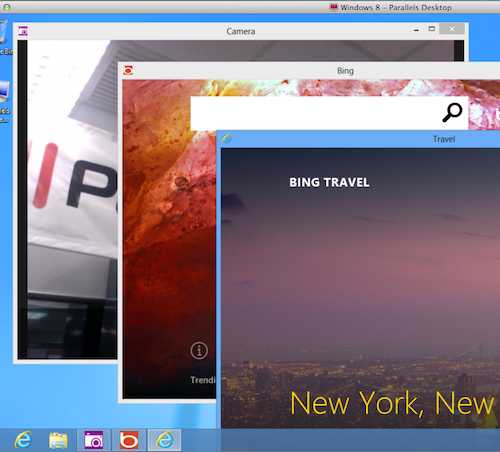 Start8 and ModernMix will only work inside Parallels Desktop virtual machines. You can use them in BootCamp®, running in a virtual machine, but if you want to use them in BootCamp running natively, you have to purchase them from Stardock.